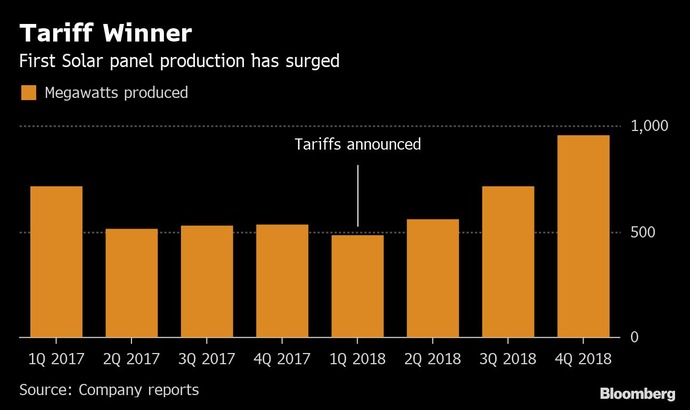 (Bloomberg) -- It's been a little over a year since President Donald Trump slapped tariffs on solar equipment imports in the name of American jobs and manufacturing. Since then, one of the U.S. panel makers that fought for the duties has been acquired, and the other is bankrupt. U.S. solar jobs fell 3.2 percent last year. And it turns out the one clear winner is an American manufacturer that has plants in Vietnam and Malaysia and didn't even initially ask for the duties. First Solar Inc., which sells more than any other U.S. solar manufacturer, is the biggest beneficiary because it use a particular technology that isn't covered by the tariffs -- even though many of its panels are made overseas. "First Solar is laughing," said Jenny Chase, BloombergNEF's lead solar analyst. SunPower Corp., the other major U.S. solar manufacturer, says it now has a pricing advantage over rivals after it won an exemption from the tariffs, but that came at a significant cost. Asian competitors have opened U.S. plants partly in response to the duties, but it's not clear whether they'll create a meaningful number of jobs. Even before the duties were announced, First Solar was able to offer pricing certainty to customers, knowing its products wouldn't be subject to duties. That's helped the company sell out its entire planned output through 2020. Solar tariffs "helped to rejuvenate domestic manufacturing and boosted both investment and jobs," First Solar Chief Executive Officer Mark Widmar said in an emailed statement. "They were able to go to so many developers and say, 'We can back you now at good, solid, reasonable prices'" Joe Osha, an analyst at JMP Securities, said in an interview. For SunPower, the tariffs were a major headache. Much of the company's manufacturing is outside the U.S., leading the San Jose, California-based company to pay about $46 million in duties. To avoid paying more, SunPower successfully argued for an exemption for some of its products. It also shelled out $26 million to buy a factory in Oregon from SolarWorld Americas -- one of the companies that asked for the tariffs -- so it could manufacture in the U.S.
"It was a big blow," he said in an interview. "It was the most significant factor for our company last year." Here's how tariffs affected other parts of the U.S. solar industry. China's JinkoSolar Holding Co. and Hanwha Q Cells Co. of South Korea both opened factories in the U.S., but they are largely automated. And it's unclear whether they'll significantly boost local economies, according to Hugh Bromley, a BNEF solar analyst.As tariffs drive up panel prices, U.S. developer are delaying or canceling some solar farms. For instance, Oregon-based Obsidian Renewables LLC put two projects on hold, and is cutting its profit in half for two others. "When a tariff comes in, I can't raise my price," co-founder David Brown said in an interview at the Infocast's Solar Power Finance & Investment Summit in San Diego. Solar jobs, which had increased annually every year through 2016, declined in the U.S. in the past two years after the initial trade complaint that led to the tariffs was filed in 2017. "Small U.S. manufacturers haven't benefited from the tariffs," Bromley said.